Writer and Director, Richard Gauntlett has created a fresh and lively pantomime that feels firmly rooting in the best of British popular culture of the past 40 years. 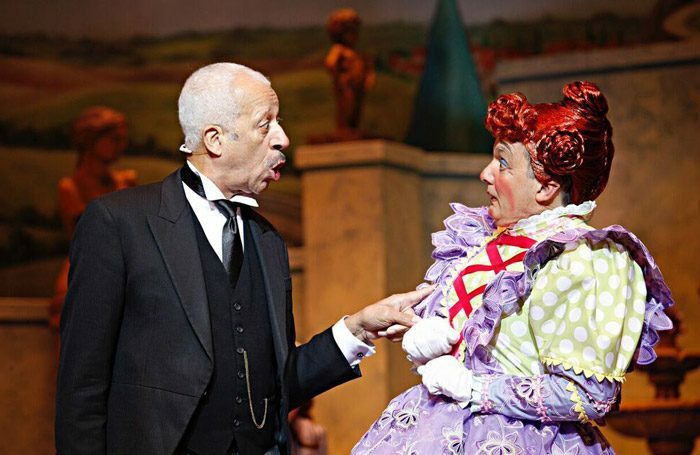 The casting of Derek Griffiths as the narrator/butler Chortwood is a stroke of genius. And while panto nods and winks at the adults in the audience, this show magically creates a world in which everyone can connect with their inner child. Gauntlett, playing Mrs Midges, and Ben Langley, playing Muddles, are Norwich panto regulars and they provide much of the witty word play and physical comedy. They have an excellent rapport with the audience, but don’t dominate the show. Glen Adamson and Elizabeth Carter, as Timothy and Patience, also have a sweet and believable chemistry and their performances also contain a good dose of sincerity. Both have strong musical theatre voices and David Carter’s arrangements add to, rather than interrupts, the narrative. All the elements in this exceptional pantomime are seamlessly linked. The child performers are adorable as the bug army of the brilliantly evil Gillian Wright. The set design is not mere back drop; it’s a vital part of many of the visual gags. The direction is crisp, the script well-balanced and the overall pace and feel of the show is pitch perfect.